Your wedding is not just the day you waited for years; it’s a day for which even your parents wove big dreams. Like you even your parents want you to look nothing less than the most beautiful women in this world for that one single day. So the two most important things that by default get the most of the planning, and top the diary of your wedding planner, are the wedding dress and wedding jewellery. Usually you tend to buy the wedding garment first and then get the bridal jewellery in accordance to it. Here are all the options you would like to go through before deciding upon your wedding accessories for the D-day. Nothing can please women more than diamonds. Diamonds and women are like best friends forever. 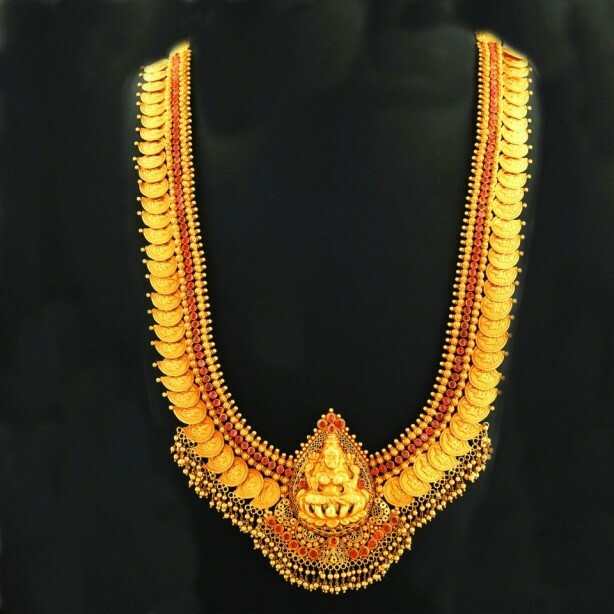 Although South Indian weddings are more popular for their Gold and Temple jewellery, Diamond jewellery off late, has gained quite a prominent place. The larger than life South Indian weddings these days shows pomp and grandeur like never before. South Indian brides are getting more and more inclined to bling diamond jewellery as her bridal jewellery. The best thing about the diamond jewellery items is that you can wear with any kind of dresses, whether it is a traditional saree or lehenga or suit or anything else. Your wedding jewellery gets a sort of extravagance when they come in glittery diamonds. Check out Mangalorian girl and Bollywood beauty Shilpa Shetty in some exquisite collection of bridal jewellery made of emeralds and uncut diamonds. Thinking of adding a royal touch to your wedding jewellery? 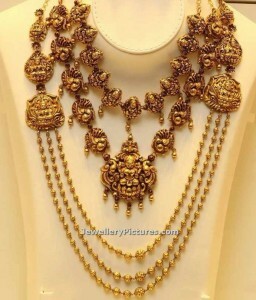 Go for Polki Diamond Jewellery items. Bridal jewellery pieces in kundan jadao or polki diamonds adds a royal grandeur apart from extravagance. Polki was initially introduced by Mughals. Such jewellery pieces are made of uncut natural diamonds. As part of your wedding jewellery you may include necklace sets, heavy chokers, chandbalis or the Jadau sets made in polki diamonds having intricate designs of Meenakari and enamel work. Recently many Bollywood actresses like Kareena Kapoor Khan and Deepika Padukone were spotted flaunting such jewellery pieces. Mango Mala or Managa Malai is like an indispensible item in the list of bridal jewellery for South Indian brides. The traditional Mango Mala is a long and intricate necklace designed with precious and semi-precious stones. It makes the bride look absolutely flamboyant yet ethnic on her D-day. It accounts to carry a rich heritage and is gaining popularity with time. 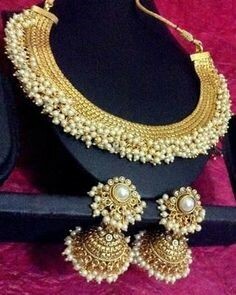 The layered chains of gold balls, at times with coloured beads and Nakshi work with antique finish; all together gives you an exquisitely beautiful look on your wedding day. Such bridal items come in designs or cravings of Goddess, precious gems and stones, uncut diamonds, polkis, nakshi balls or south sea pearls. Nakshi waist belts or vaddanams or kamarbandhs are quite popular items. Whether it is the haath-phools, maang-tikkas, thick bangles or kadas, vanki or baju-bandhs, waist belts or kamar bandhs or a necklace; anything in gold has comes with great opulence. Check the Konkani speaking Bollywood actress Deepika Padukone wearing a golden haath-phool in the grand blockbuster movie Bjirao Mastani. Beside her is a pic showing an antique baju-bandh. Gutta Pusalu haram is a famous South Indian traditional design with heavy bunches of beautifully adorned small pearls, clustered along an antique gold chain. 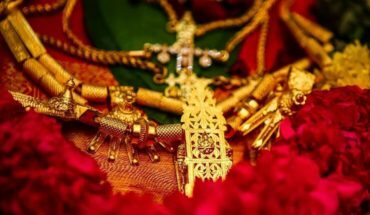 The Gutta pusalu haram or necklace is usually studded with rich rubies, emeralds or kundans and looks very graceful which is why it has become a trendy choice for today’s brides. Some of the Gutta pusalu necklaces come in reversible models with different colored stones studded on both sides. 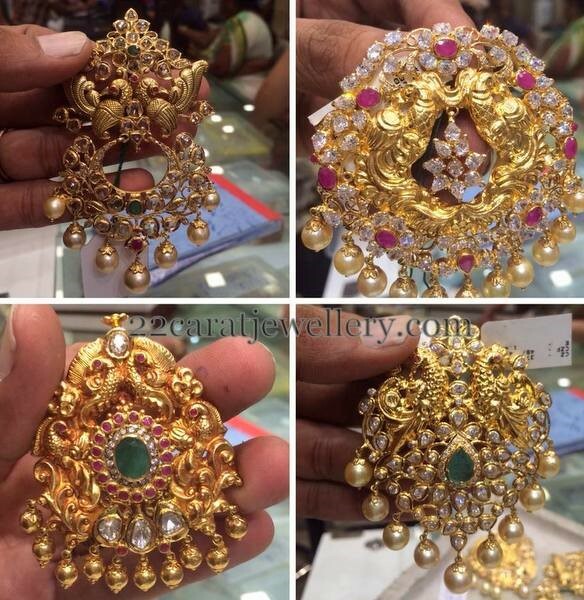 Pacchi work is one of the most intricate art form so far jewellery making is concerned. It is created with glass stones or beads, coloured pacchi leafs, and pearls. Each and every leaf is designed by hands on the top of the other, which gives it a three dimensional look. Kasu haram or kasulaperu is a traditional neckpiece designed with coins put together with embossed design over them. It is timeless jewel mostly common with the Keralites. Mangtika or mathapatti completes the look of the bride. It graces the forehead of the bride and brings the best in her overall look. Check sizzling Bollywood actress Kartina Kaif adorning herself with a typical South Indian mathapatti, in the pic below. Although used in a yesteryear film Pakeezah, the half mathpatti or side mathaptti as worn by the quintessential beauty Meena Kumar can make a woman look beautiful like never before. 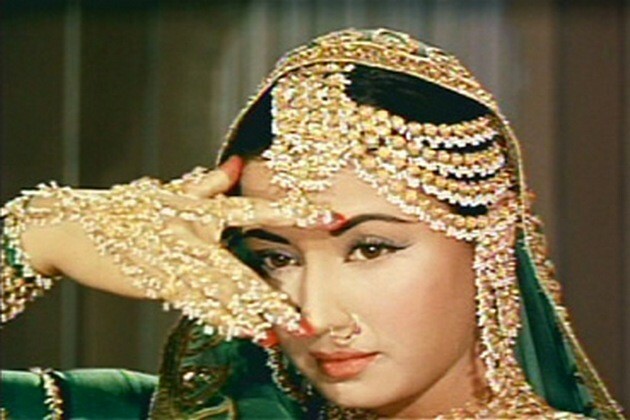 Also known as the Pakeezah jhoomar allows the bride to have a side parting of her hair unlike the usual center parting. Please leave your comments or suggestions in the comment section below.